I’ve been in business as a photographer for 8 years, and for all but the last 9 months, I did it while working a full time job. I absolutely know what it’s like to feel like you will never have enough time in the day to get anything done. I understand feeling like you have no free time because every second is either spent working your job, or working your business. I get it because I’ve been there. But honestly, I’m so glad I did it the way I did. Because of the way I grew my side hustle, I was financially ready to leave my full time job YEARS before I actually did. In the 9 months since I’ve left my full time job, we’ve never once struggled to pay a bill, and I’ve never been nervous about needing to book more clients or make more money so we can get groceries or pay our bills. Ever since I had a substantial enough portfolio to show my work, I have been charging what I need to make as if I didn’t have another job. I don’t understand when I talk to other folks who have side hustles and they tell me they won’t charge more than what they’re charging because they “aren’t full time.” I don’t know about you, but even when I had a full time job, I was putting in PLENTY of hours in my side hustle to be qualifying as a ‘full time’ business owner – I just happened to have another job on top of it. And want to know something else? No one cares if you are full time. If your work is excellent and you provide an incredible service and experience, who cares if you’re doing it during the day in a bright office, or at night from your couch after your kids go to bed? While others may argue that side hustlers can charge less because they aren’t relying on the income to pay their bills, I couldn’t disagree with that more. As a side hustler, your time is even more important because your business is taking you away from your family outside normal working hours. My thinking was always that if I was going to be away from my family during “family time” (nights, weekends), I needed to be fairly compensated for that. That way, we had the freedom to pay down a ton of debt, go on great vacations, and pad our savings accounts. It set us up for major success for when I actually DID ‘go full time,’ and I truly believe it’s a big part of the reason why it’s been such an easy transition. If you have no idea what you should be charging, it can be really difficult to know where to begin. 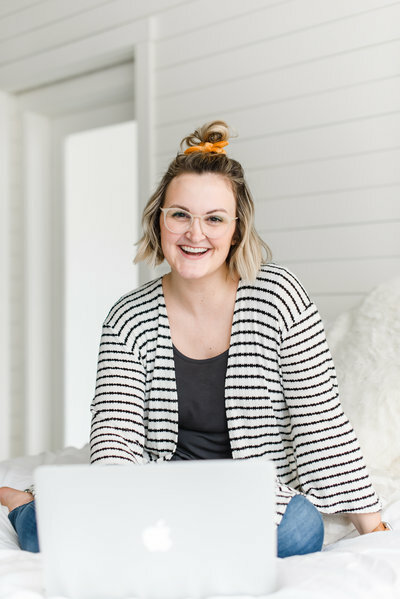 I believe so strongly that pricing is key to a successful side hustle, and I want to help you out. Years ago, I found a great exercise for making sure I’m priced where I need to be to make a full time income, and I want to share it with you. 1. Determine how much you want to make each year. For example, if you are working a full time job making $50,000/year, maybe you want to completely replace that income. In my case, I knew that running my own business had a ton of hidden costs and taxes to pay, so I wanted to make 1.5-2x my salary. I knew that at that point, I would be able to live off my salary + pay my bills + run my business comfortably. Don’t let this number intimidate you! It can feel really big and scary, but we’re going to break it down even more. Knowing this number, even if it’s slightly terrifying, is your motivation to make sure you are charging an actual living wage and profiting in your business. This number is the reason why $150 sessions are NOT sustainable. This step is easy since we’ve already done the hard work! Let’s say you want to make $50,000 each year. That means each month you need to be averaging about $4,167. How many sessions each month are you comfortable with? Since I was working full time and raising babies, I knew it wasn’t realistic for me to spend every single week night shooting a session, or every weekend shooting a wedding – and I wouldn’t want that anyway! A big part of me loving my job is having breathing room from it, so I prefer 1-3 sessions a week. Of course, also keep in mind that depending on the area you live in, certain times of year may be much busier (fall) or much slower (winter in the midwest…yikes). Let’s say you want to shoot three sessions per week. Since that averages out to about 12 sessions per month, you will need to be pricing sessions around $348 each. Keep in mind that when you consider prepping (calls/emails, scheduling, planning) for each client and editing each session, 12 session per month may be way too much! Play with this number until you find something you’re comfortable with. The hardest step of them all! Once you have your price, be confident in it. You know your numbers now. You understand what your time is worth. Stick to your guns! And remember that by charging more per session, you have the freedom of booking less. Still have questions about pricing? Leave a comment below or come chat on Instagram! Very helpful! Thank you for sharing! This is great advice! Those hidden costs got us our first few years where it was basically a wash to be in business. Yay for learning and working smarter, not harder!! Seriously so good to put into perspective. This year especially after taxes, I was like uhhhh woah, I need to charge more to be sustainable. Ahhhh yes, SO good! I continued to work my nursing job for several years while I built my business, and still worked casual part-time for another 18 months after I quit. I LOVED not having to put the financial pressure on my business. And who doesn’t love a little extra $! You are not a failure for having a side hustle OR having a job. Both are a win-win. I love this so much! I am pinning it so I can reference it later as well! It is so scary making the jump towards sustainable pricing, but so so important! Thanks for this insight! Such a helpful post!! Pricing is always the topic that sends most of us into a tailspin of where to even start!! This is a fantastic way to approach it!! Totally agree!! Charge what you’re worth whether you need the money or not! YES! It is OK to make money off a job you love!! Took me so long to be happy with that and not feel guilty! « What is a Lightroom Preset?